David Herbert Lamon, 68, of Taneytown, passed away on Friday February 1, 2019 at his home in Taneytown. Born May 12, 1950, he was the son of Betty Lou Lamon of Westminster and the late Herbert H. Lamon. 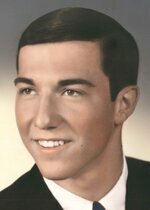 A 1968 graduate of North Carroll High School, he played varsity soccer, basketball and ran track. He was a Union electrician with Local 24. Surviving in addition to his mother are sisters, Michelle Lamon of Reisterstown and Sharon Armacost of FL, and extended family. A Celebration of Life will be held on Sunday February 10, 2019 at 2:00pm at ELINE FUNERAL HOME, 934 S. Main Street, Hampstead. Interment will be at a later date. Online condolences may be made at www.elinefh.com.